A new telemedicine program at the University of Rochester Movement Disorders Clinic in Rochester, New York, supported in part by funding from the National Parkinson Foundation, is allowing patients with Parkinson’s Disease to see their doctors remotely via video-conference. This exemplifies a growing recognition of the important benefits to be gained by using “telemedicine” to allow patients to visit doctors and specialists remotely via teleconferencing. For a detailed description of the importance to Parkinson’s patients of the ability to see the specialists they require via telecommuting, and for an account of the experiences of specific patients with the New York program, see the NPR Special Report: The Parkinson’s Doctor Will Video Chat With You Now. Available technology currently is adequate to support such telemedicine programs, and “Clinical trials of telemedicine have found that the quality of care is at least as good as with in-person visits,” according to NPR. However, a primary challenge now is covering the costs for patients. 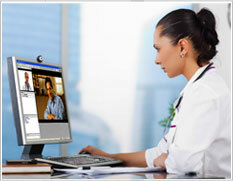 At present, the cost of seeing a doctor via telemedicine programs such as these generally is not covered by insurance in the U.S.
Medicare covers such remote doctors visits only if the patient lives in what the Medicare program considers a rural area — which is very restrictive and excludes several smaller cities and towns, NPR reports. Another challenge is that doctors in the U.S. are licensed state by state, and under the present licensure system, a doctor in one state cannot treat a patient in another state, unless the doctor is also admitted to practice and licensed in the patient’s state. “The government [of Canada] has invested in telemedicine in a big way, building the world’s largest medical teleconferencing system, with more 1,000 videoconferencing suites at local hospitals across the country. Not only do doctors not have the problems getting paid for telemedicine that they have in the United States, but they also get a bonus — $15 to $25 per visit — for seeing patients remotely. Perhaps the U.S. needs to “take a page from Canada.” We could learn from the Canadian system. If the U.S. and the States could establish laws and policies to overcome the barriers currently preventing the wider use of telemedicine in the U.S., patients could realize the benefits of seeing the specialist they require, even if the doctor is too far away to travel there for each visit. At the same time, the overall costs of medical care could be reduced.